SUNDAY ‘Mhofu’ Chidzambwa has refused to take credit for leading the Warriors to the Africa Cup of Nations finals for the second time in his coaching career. 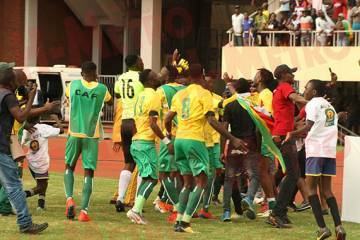 Zimbabwe yesterday secured a place at the 2019 Afcon in Egypt to be held in June with a 2-0 win over Congo-Brazzaville in the final qualifier of Group G, their fourth appearance. The result meant the Warriors won the group with 11 points and will be joined by Democratic Republic of Congo, who finished on nine points after defeating Liberia 1-0 yesterday. Khama Billiat and Knowledge Musona scored for Zimbabwe in the first half. And for Mhofu, who broke the country’s football jinx by leading the Warriors to their first ever appearance at Afcon in 2004, said credit should be given to the players. Mhofu said the players have made the nation proud in the campaign and he is happy for them. “We have some great players in the team and the first time we qualified in this country, we also had great players in the likes of Peter Ndlovu, Adam Ndlovu, Ronald Gidiza (Sibanda). “They are doing very well, they did well for the nation and I am happy for them,” said Mhofu. Mhofu hailed his captain Knowledge Musona after leading the team despite his injury concerns. He said they could not leave him on the bench given the input he gives to the team. “We knew what Knowledge (Musona) can do in a game . . . as you saw, he scored the great goal from nothing. “We cannot leave such a player and that’s why we chose him to start,” said Mhofu. 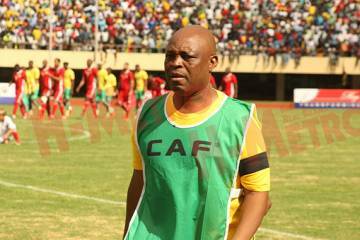 Zimbabwe played before a near capacity National Sports Stadium and Mhofu saluted the fans for coming out in numbers. The veteran coach is happy that the result came their way as they had dedicated the game to the victims of the Cyclone Idai. The Warriors played with black armbands while a moment of silence was observed before kickoff. “I would like thank the supporters, they came in their thousands and supported the team and never jeered the players. “Before we came here, we (had) dedicated the game to the Cyclone Idai victims and the game came our way,” he said. On his tactics, Mhofu said they played an equally good team but were fortunate to convert their chances. “Tough luck to the opponents, they are a good team. In the first half, we realised that our opponents’ strategy was to try and outpace us on the flanks and used the high balls to the strikers which they didn’t do in Congo. “We had to defend well and fortunate enough we scored two chances that cane our way. Second half, they created a problem for us, of which we nearly failed to rectify. “Both teams as far as I’m concerned didn’t create so many scoring chances,” he said. He said the important thing on yesterday’s match was for them to qualify. “The other thing you have to realise is that sometimes in football you have to play for a result which we did, we played for a result, we played to qualify, we didn’t play to entertain,” he added.